“She stared at herself in the mirror. Her eyes were dark, almost black, filled with pain. She’d let someone do that to her. She’d known all along she felt things too deeply. She became attached. She didn’t want a lover who could walk away from her because she could never do that – love someone completely and survive intact if her left her.” ― Christine Feehan, Turbulent Sea. 1. She tried to communicate with you, she showed all signs of leaving but you were too busy with yourself to even look at her. In the end, she couldn’t take it anymore. In the end, she decided to quit because you weren’t there for her. 2. She wanted to be with you, she tried to reach out to you but you didn’t respond. And she walked away because you were your first priority and had no space for her in your life. 3. She walked away because you never had time for her. She was always there for every little thing of yours but you couldn’t be there for her, at least for once. 4. She walked away because you ignored her. You didn’t want to understand herneeds but you always expected her to understand yours. 5. She walked away because you couldn’t be trusted or relied upon. She couldn’t on you. 6. She walked away because you became a stranger for her. From lovers, the two of you became strangers and no matter how hard she tried to breach the distance, you made it harder for her. 7. She walked away because she was tired of being lonely. She was tired of your indifference. 8. She walked away because she realized she wasn’t happy in the relationship anymore. She forgot what it feels to be like in a beautiful relationship because you didn’t make her happy. 9. She walked away because she was tired of crying all by herself. She was tired of living with the fact that she had a special someone in her life but that special someone didn’t even care about her pain. 10. 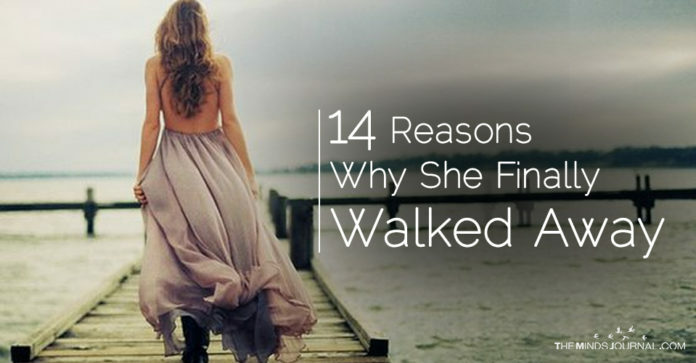 She walked away because there was nothing she could love in the relationship. You made the experience traumatic for her. She couldn’t be happy, she couldn’t be at peace. 11. 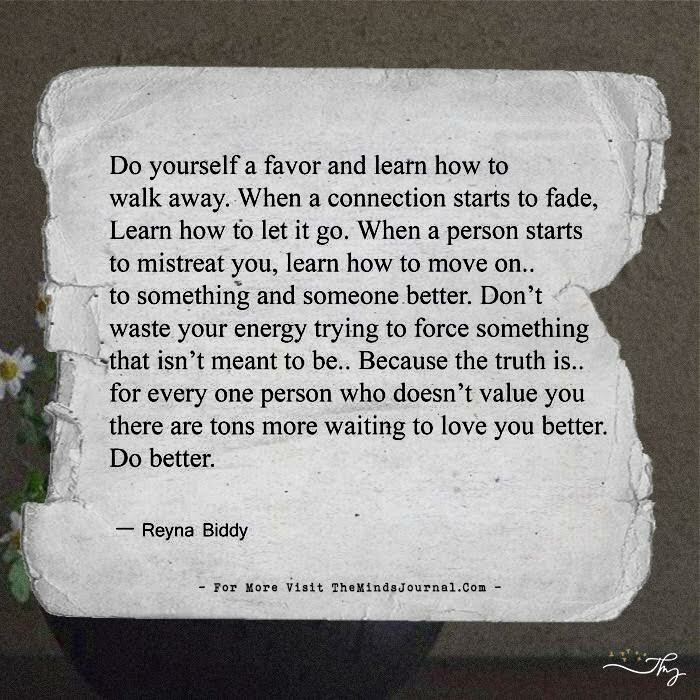 She walked away because she realized that love needs reciprocation. You never reciprocated. You took her for granted. 12. She walked away because you set her free. You gave her so much of pain that she had to leave to save herself. 13. She walked away because she realized she was inflicting pain on herself.She realized that by staying in a relationship where she was the one who was doing things, feeling the emotions while you remained cold. 14. She walked away because she stopped respecting herself, loving herself.She has been too broken and she knows she is alone. She knows she has to practice self-love to get herself back to the woman she was. And she knows she deserves a man who is far better than you.